Raw data from 10 user interviews. Try not to be intimidated by the amount of data. If you feel like you have too much data, know that there is no such thing! It all means something. You have to take your time and make sense of it all. It may take a few hours but rest assured, you can tame this beast of information. Enlist the help of a team if necessary. 2. Try not to worry you don’t have enough data. I’ve created a few affinity diagrams and one of the many things I am initially concerned about is whether I have enough data. If you feel you don’t have a lot, don’t worry. You don’t need a lot of data to draw conclusions. As you start to organize and structure your information, new ideas and insights will surely surface. In that case add this to your diagram. If you still feel like things are missing revisit your research. You may have to do a bit more. Don’t get rid of the diagram you started though. Take it down carefully with the intent to rebuild it. 3. Don’t be afraid to add or remove notes and ideas. 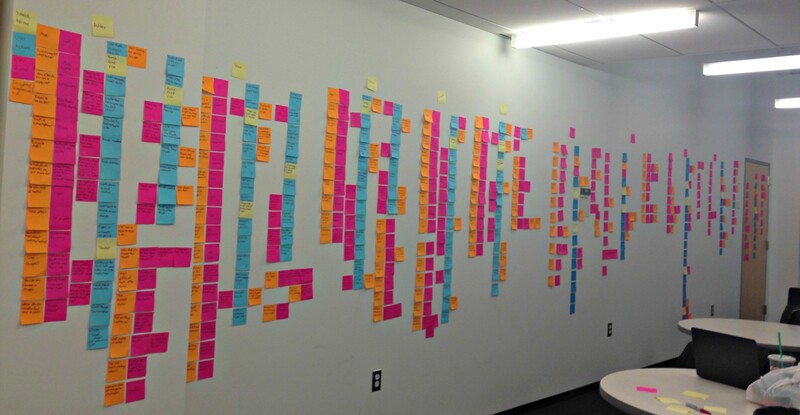 An affinity diagram is not meant to be a masterpiece. It’s meant to be flexible so don’t be afraid to add new ideas or remove ones you realize are not particularly helpful. 4. Try not to prematurely add hierarchy, timelines, etc. 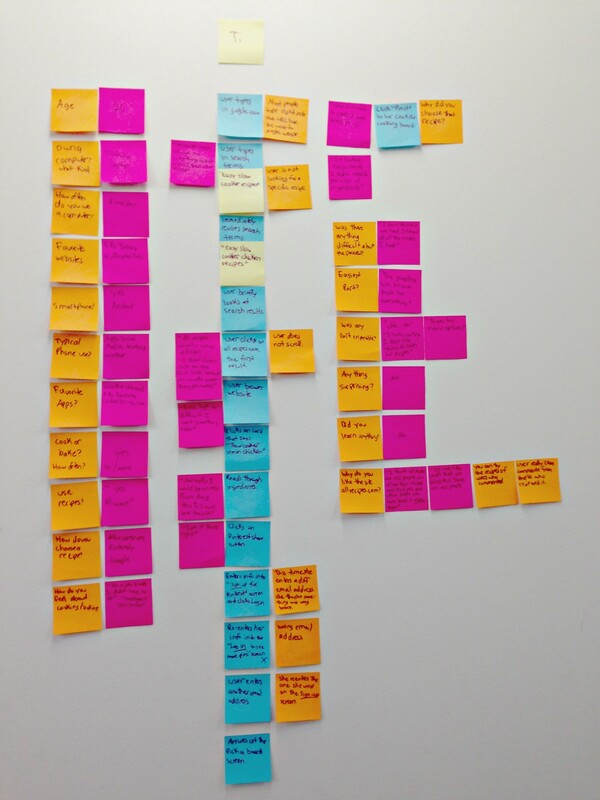 The main point of an affinity diagram is to find trends, and put things into categories. Group items with like items. Don’t try to add hierarchy, process and connections between groups too soon. Your affinity diagram will begin to become a different diagram and this might lead to confusion or frustration about how to organize things. This will also limit your thinking about what ideas and notes can and cannot go into what groups. After you have grouped everything and you’ve reviewed everything again, then go back and draw conclusions about hierarchy etc. 5. Be clear, create a key and stick to it. If you are working with actual sticky notes you will probably want to make a key. This will make it easy to rebuild if you have to take it down and work with it in the future. Make sure its structured in way where you can do this. Give enough structure and direction that anyone who was handed your stack of sticky notes can recreate it. You can do this by giving colors and orientation of the sticky notes meaning. This is a picture of our raw data from the user interview, but each color means something here. 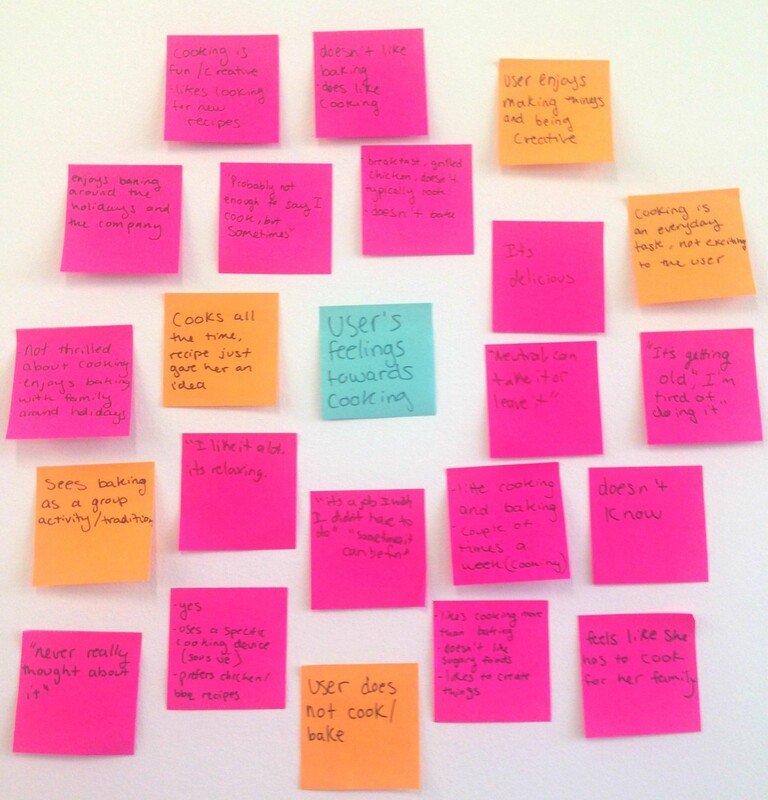 Pink sticky notes are user quotes. 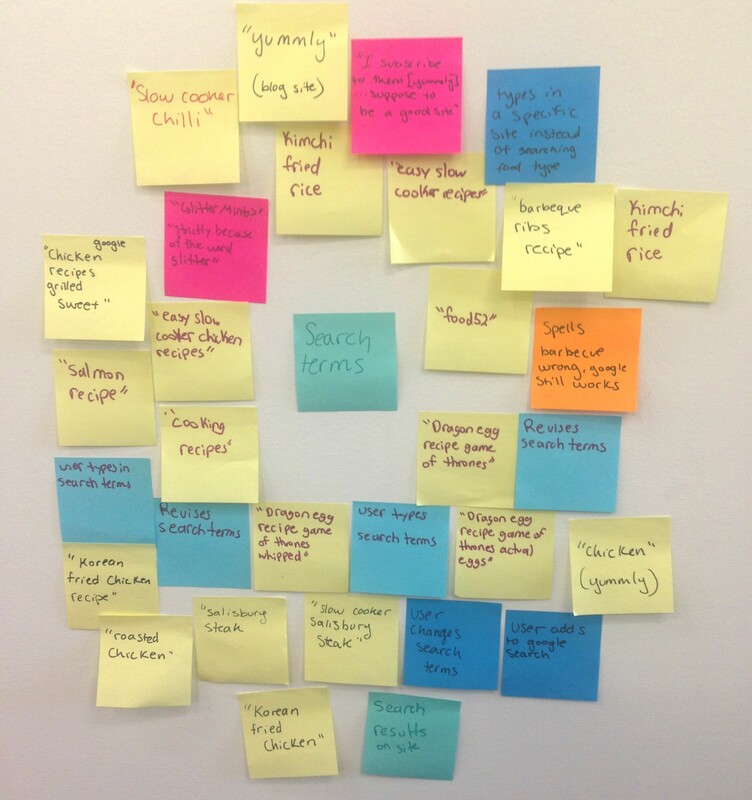 Yellow sticky notes are questions and insights from the researcher. Blue are the steps in the process and so on. 6. Let the categories figure themselves out organically. Don’t force yourself into pre-decided categories. After doing your research you will likely already be thinking about trends and categories you noticed. However, you don’t want to try to force all your ideas into these categories. Many times categories will get larger, or broken out to be smaller and more specific. Group like items with like items. Then go back and create the category labels for each. Be open-minded and flexible. New trends will emerge. You will want to move things around. 7. Give yourself enough space. Find the biggest wall you can find. If you have a lot of data you will want a lot of space. Try to gauge how much space you need and then add to it. Having to move whole clusters of ideas closer or farther apart multiple times is a pain. Not to mention, your sticky notes may lose stickiness! 8. Take lots of pictures. Ideally of each cluster so you can go back read them as well as the whole diagram so you can see how everything was put together. This will help if you need to rebuild them. The Post-It notes app is great and taking pictures is a quick way document things so you can take them with you. 9. Have fun. Our final diagram turned out to look a lot like flowers. Ta-Da! Our finished affinity diagram. Master’s students at Jeffferson University writing about UX and becoming a UX professional.